The phrase “A boy and His Dog” conjures images of a young boy and his faithful, loyal companion blissfully enjoying childhood adventures together. The following poem by Edgar Guest expresses it well. Dogs are wonderful additions to a family and can teach children patience, tolerance, and the responsibilities involved in caring for a living creature. 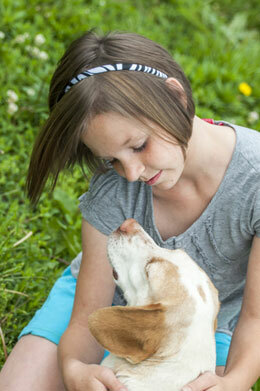 Dogs offer unconditional love and loyalty and can become devoted companions for children. Many adults have fond memories of the family dog from their childhoods. At times a child’s relationship with their dog is as idyllic as it sounds, at other times it can be difficult and frustrating. Let’s begin with the reasons for bringing a dog into a home with children. The pet industry will confirm that the sale or adoption of a dog often coincides with a holiday or a child’s birthday. There is nothing cuter than a photo of a surprised and excited child with a puppy in a Christmas stocking or Santa hat under a tree on Christmas morning, or the look on a child’s face when presented with a dog as a surprise birthday gift. Parents are looking for a “WOW” gift to delight their child and they truly believe that a dog added to their home will be an easy, carefree experience that will enhance the experience of childhood. Other dogs are purchased because a child has repeatedly begged for a pet and promised sincerely to care for it. The reality is that despite good intentions the novelty of a new pet wears off in about two weeks and the care of the dog becomes a chore the child is tired of and guess who is left walking, feeding, grooming and training the dog? 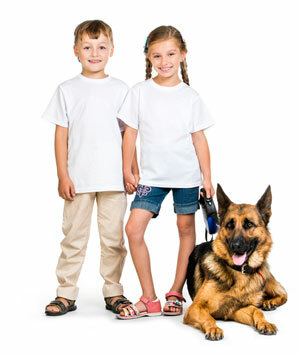 Children over the age of 7 are generally better at understanding and accepting responsibility and are better at caring for a dog than those that are younger. A living animal cannot be discarded like the newest toy that a child has tired of. Before adding a dog to your household, think carefully about the long term responsibilities of caring for and training a dog, estimate the cost and time required and the disruption to your current family life. Ultimately the responsibility for the pet lies with the parents and they need to be 100% committed to train and care for it for the long run. The age of a child plays a role in the success or failure of adding a pet to your family. The safety of the child is of utmost importance. 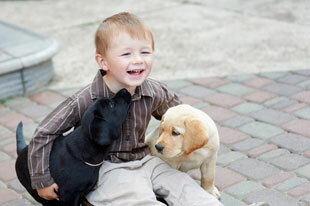 Statistics prove that most injuries to children caused by dogs occur in children under the age of 6. Even the most even tempered, patient dog will react with aggression under what is perceived by the dog as a repeated attack from a child. Often curious children, in an innocent attempt to play, will take away a dog’s toys or food, climb or step on the dog, attempt to ride it, poke its eyes or pull its fur, tail or ears. All of these behaviors are unpleasant or painful for the dog, particularly if the dog had been sleeping or resting at the time they occur. Additionally, children screaming or yelling loudly is an irritant to a dog’s sensitive hearing. Most dogs will attempt to flee and only become aggressive when cornered and unable to get away. Provide an area where the dog can retreat, possibly a dog bed, and teach children to stay away when the dog is there. A growl is also a warning sign that the dog is reaching its tolerance limit and needs some quiet space. Children should be taught to back away when a dog growls. Small children need to be trained in how to gently and appropriately approach and touch an animal. Their interaction should involve gentle petting, helping with a walk or playing a game, always under adult supervision. Rough or hurtful treatment should never be tolerated. As the dog and the child become better acquainted, interaction can increase. Take it slowly at the beginning of a child-pet relationship and always keep safety in mind. When you encounter dogs in public with their owners, teach children to always ask the owner’s permission before approaching the dog. If given the okay, approach with the hand out, allow the dog to sniff and then pet it under the chin. An arm moving over the head to pet a dog can be perceived as an aggressive movement. Adult supervision is always required. Just as children need to be trained in how to interact with a dog, the dog needs to be trained to behave appropriately with children. An excitable jumping dog can easily knock a child down and injure them. Controlling jumping, biting, nipping and growling is key to co-existing peacefully. The goal is mutual respect between the dog and the child. Some breeds of dogs are better suited temperamentally to living in a home with children than others. Although opinions differ on this subject, there are a few breeds all agree are good with children. These breeds include; Beagles, Bull dogs, Boxers, Collies, Labrador retrievers, Golden retrievers, and mid-sized mixed breeds or mutts. Other considerations are age, size and energy levels. Puppies are very cute but are akin to adding a new baby as far as time and training commitments. Sometimes older dogs have developed bad habits and retraining is necessary. The age of the best dog for you is a personal choice. All require an adjustment period on the part of everyone involved. The best way to find a good match for your family is to spend time with the dog you are considering adopting. It will be quickly clear if there is an easy interaction with your child or not. Often it is the dog that picks the family. With diligent training of both dog and child, adding a dog to your family can be a heartwarming, rewarding experience that will create long lasting positive memories for your child and your whole family.